1. In a bowl, combine flour and 1/4 teaspoon salt. 2. Add diced butter and work to incorporate. It is sufficiently mixed when there are still very small pieces of butter in the flour. 3. Add yolk and water mixture. Mix just enough to incorporate and create homogenous dough. If necessary, a small amount of additional cold water can be added, depends on the flour. 4. In a small saut� pan over moderate heat, saut� the onions in butter until softened, about 5-6 minutes. Remove from the pan and let cool. 5. In a bowl, combine cooled saut�ed onions, eggs, milk, remaining 3/4 teaspoon of salt and black pepper. Reserve. 6. Roll out butter dough and line a 9-inch-deep pie tin. Be sure to "roll" the edges of the pie so that they "stand up" on the rim. 7. Fill the pie tin with camembert and ham. Pour the egg and milk mixture over the top of the camembert and ham. 8. Place tomato slices between several thicknesses of paper towels. Press firmly to expel as much liquid as possible without crushing the tomato slices. 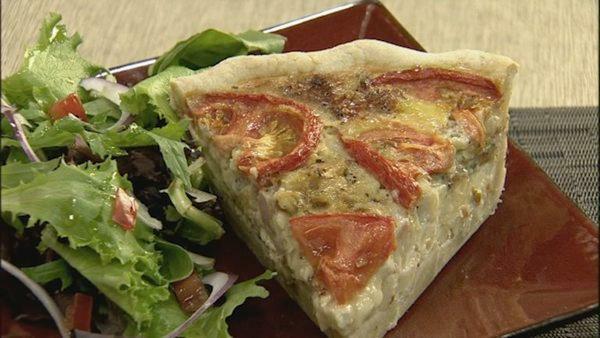 Arrange the tomato slices on top of the quiche. 9. Place the pie tin on a baking sheet and put in a 350 F oven. Bake for approximately 1 hour or until the quiche has solidified. 10. Remove from oven and let cool before slicing into wedges.